More Jesus | "Northern Crossings"
can fix. I thought about that the other day when someone mentioned that pastors have to get them selves kind of psyched up for Easter. My response was if you’ve got to get psyched up for Easter you got more problems than getting psyched up about Easter can fix. By the same token when you’re done preaching on Easter I believe if you have done it right, you are pretty much worn out. It makes no difference if you preach once or five times on a Sunday you should be exhausted. That’s where I found myself yesterday. After three services I was worn out. I was excited I was happy but I was preparing for one more worship service at one more place and I turn on the radio for a moment and heard an interview of Eric Metaxas and it was all I needed to get ready to go again. These interviews are not always professional and sometimes a little bit silly. At some point the hostess said, “I would like you to tell me what you think the world needs more of on this Easter Sunday?” Metaxes’ answer was “Jesus”. We don’t need more peeps and bunny ears, we need Jesus. 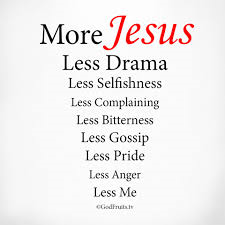 That’s what we need more, Jesus. The answer to all of our problems is Jesus. To hear that said over the airways, by an obvious erudite and learned individual was a balm for the soul and much appreciated. It sounds strange to say that but for 38 years of my ministry I have been trying to make sure that everything I preach is Jesus. The obvious question would be, “you have been in the ministry for 40 years and my answer would be that as it took me a couple of years to figure it out. It still has to be rehearsed and remembered that anything that is not Christ is sin and destruction. If we do not preach Christ we preach a phantom that we raise in our hearts and call faith. Preaching Christ is preaching the cross which is foolishness to the Greeks and a stumbling block to the Jews, but it is the power of God to save us. That the sacrifice of Christ on the cross was enough to save us is proven by the resurrection. The cry from the cross that “it is finished” is amazing. The dividing wall of hostility with God is gone and life everlasting is free. Hard not to excited about that.